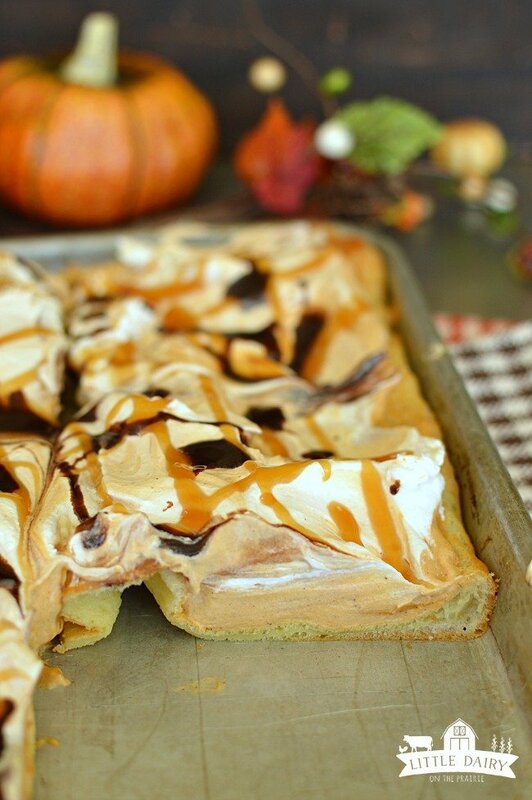 Pumpkin Eclair Cake is and easy and impressive dessert! 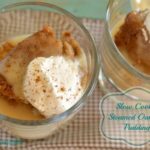 It begins with a puff pastry crust, creamy pumpkin spiced pudding, and is piled high with whipped cream! 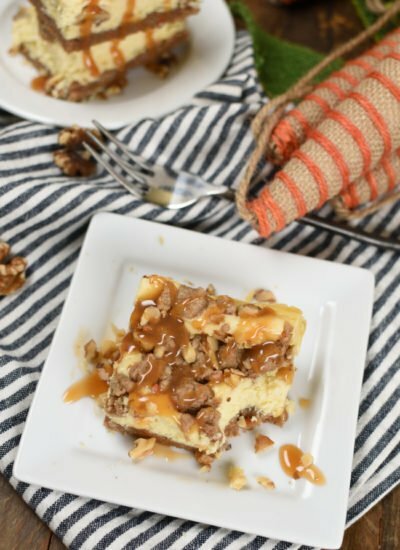 Drizzle the top with chocolate and caramel sauce and a give it a sprinkle of crunchy walnuts! It’s a little bit of heaven on a plate! Dairy farmers work every single day of the year. We work Saturdays, Sunday, Christmas Day, morning, nights…every single day! Cows producing milk must be milked at least twice everyday, very similar to a mom who is nursing. In fact, there are cows being milked in our barn 24 hours a day. Thank goodness we have amazing employees who help us out…a lot! We appreciate them. I decided to show them just how much we appreciate them I would make them a Pumpkin Eclair Cake! It’s easy to throw together, makes enough to share, and I knew they would love it! There was only one small problem with the Pumpkin Eclair Cake…my family ate the entire thing before I even had a chance to share it! I guess I will have to make it again and hide it so I can share it with the employees! This is really easy guys! 1. Boil water and butter. 2. Add flour, salt, and vanilla and stir together. It will be thick. 4. Mixture will be a little thinner, about the consistency of cake batter but maybe a little stickier. 5. 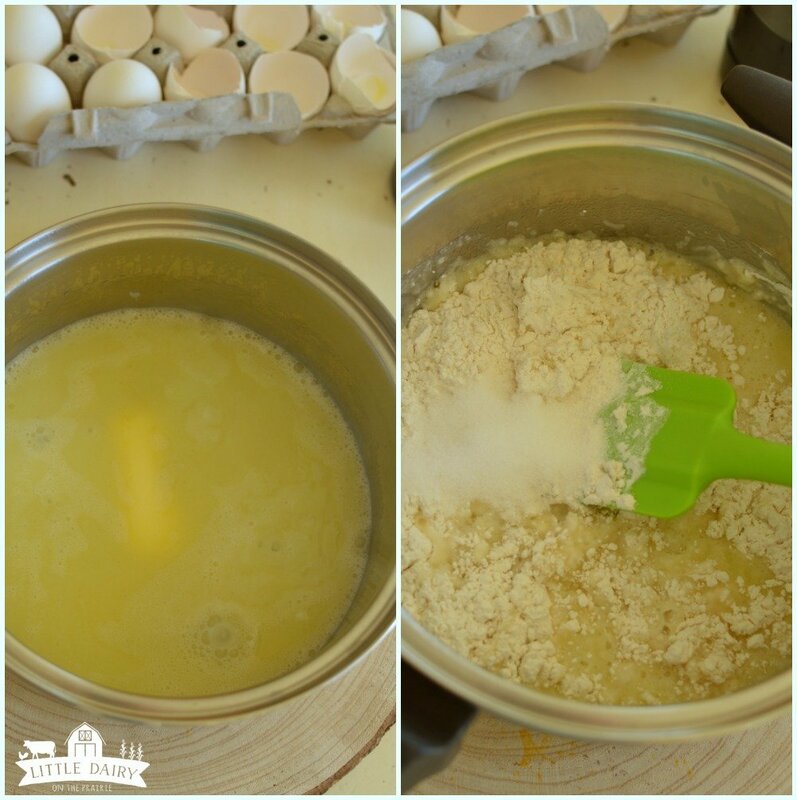 Spread the cream puff batter into a greased 9 x 13 pan or into a jelly roll pan. Obviously if you use a 9 x 13 pan it will be thicker and it will be thinner if you make it in a jelly roll pan. 6. Bake cream puff crust. It’s going to have craters, mountains and crevices. That’s okay. 1. Make Pumpkin Spice pudding as directed on package. 2. Fold in 4 oz. whipped topping. 3. After cream puff crust has cooled spread pudding mixture over pastry. 4. Spread remaining whipped topping over pudding. I swirled whipped topping and pudding together a little bit. 5. Drizzle with chocolate and caramel syrup. I sliced my Pumpkin Eclair Cake into pretty big pieces, maybe that’s why it was gone before we had time to share. 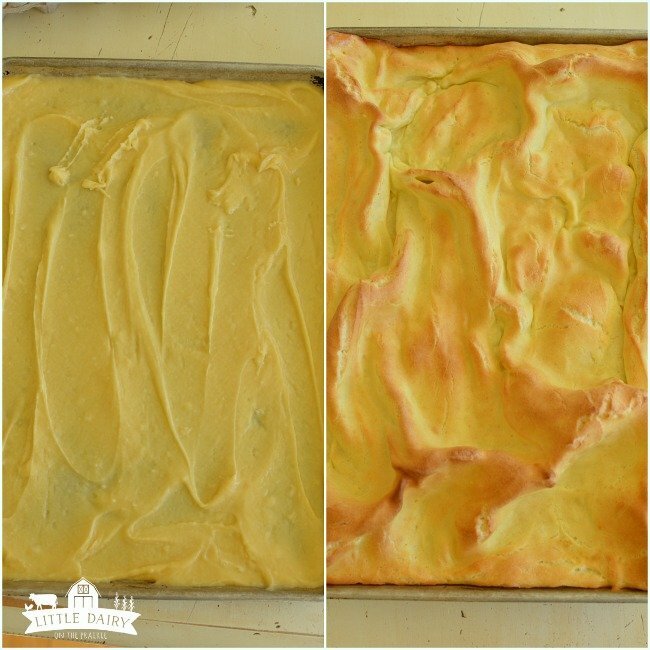 Most of the time I choose the middle pieces of dessert, but with Pumpkin Eclair Cake I can’t decide which I like better, the edge pieces have more yummy cream puff and the center has more filling. Maybe it’s best to not try and choose and have a piece of each! 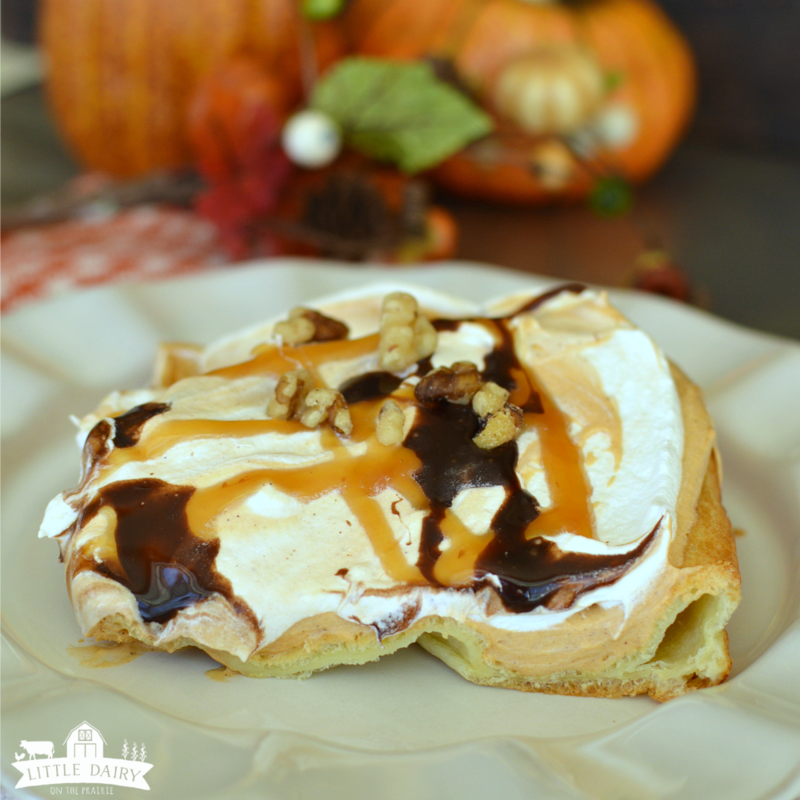 If you need a quick and easy dessert for fall, Pumpkin Eclair Cake is exactly what you are looking for! It’s so much easier to make than it looks. 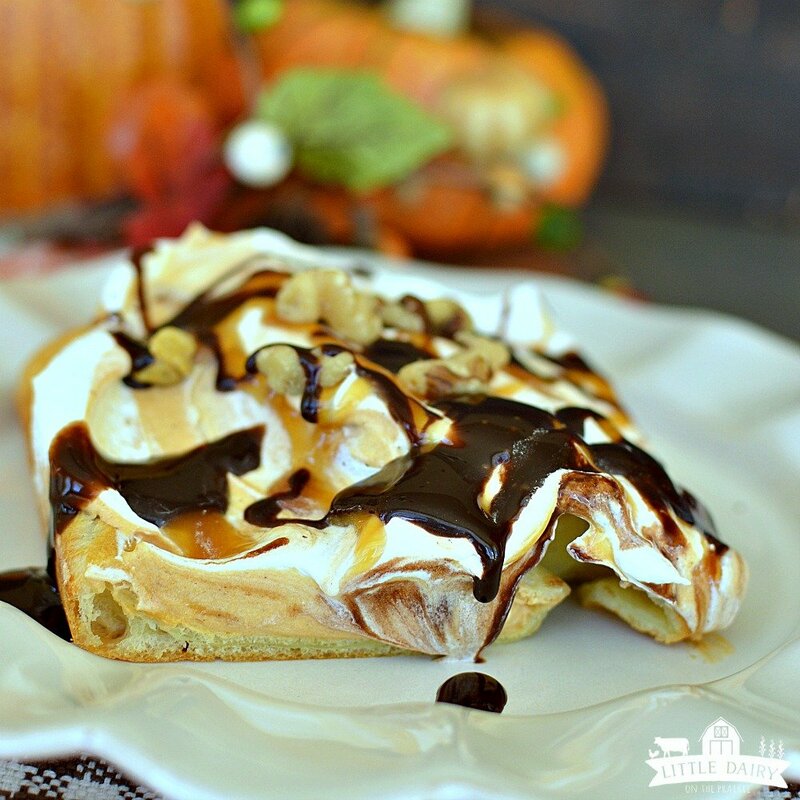 It has that magical cream puff crust, a luscious pumpkin pudding filling, and decadent whipped cream, all drizzled in chocolate sauce! This one is a keeper! 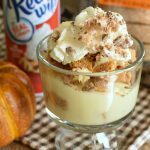 If you are looking for an impressive, yet super simple fall dessert, Pumpkin Eclair Cake is for you! It begins with a puff pastry crust that is filled with pumpkin spice pudding, and topped of with whipping cream! You can garnish it however you like, but chocolate is always a good idea! Preheat oven to 400 degrees. Grease a 9 x 13 pan or a jelly roll pan. Bring water and butter to a boil. Remove from heat. Add vanilla. Stir in flour and dash of salt. Mixture will be thick. 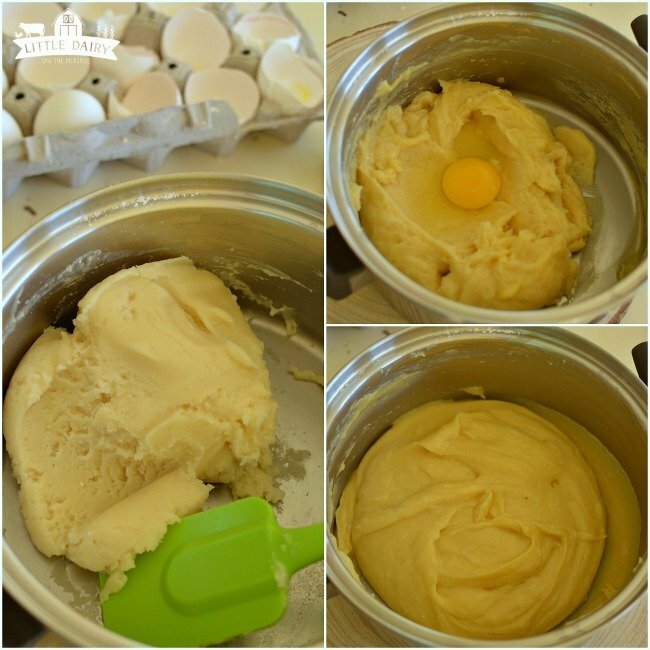 Add eggs one at a time, stirring to completely incorporate after each egg. Mixture will be a little thinner, about the consistency of cake batter, maybe a little stickier though. Spread puff pastry dough into which ever size pan you choose. Bake for 25-30 minutes. 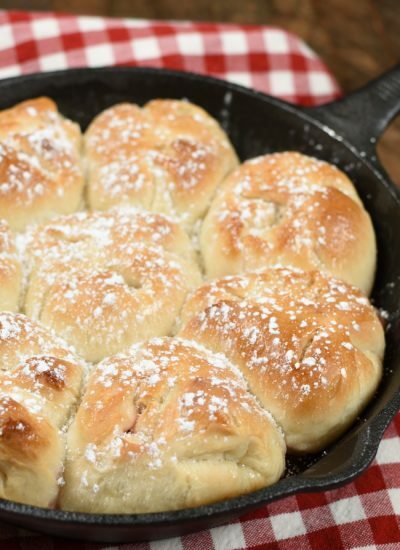 The jellyroll pan will take a little less time than the 9x13 pan because the dough is spread a little thinner. Watch it carefully so it doesn't get over baked. The cream puff crust will develop mountains, craters, and valleys and that's exactly what it's supposed to do! Cool crust completely. 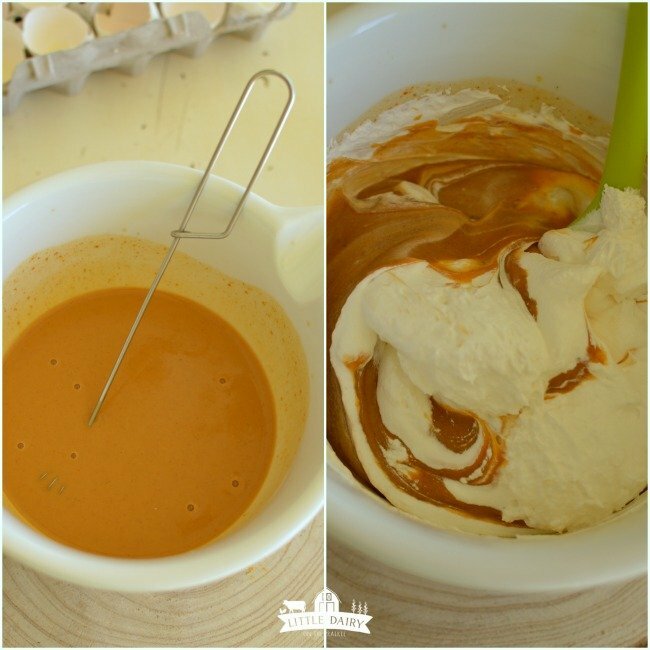 Whisk pudding and milk together. Let sit for 5 minutes. Fold in about 4 ounces of the whipped topping. Spread on cooled crust. Top pudding layer with remaining whipped topping. The two layers may get a little combined. If you want you can swirl them together a little bit. Serve garnished with chocolate and caramel sauce. Some members of my family like sprinkling walnuts on top too! This looks decadent and delightful!! I think my kids would be so excited if I made this now in pumpkin baking season!! It’s definitely that “pumpkin everything” time of the year! And yes, the kids go crazy for it! What a delicious cake to treat your family and employees to! 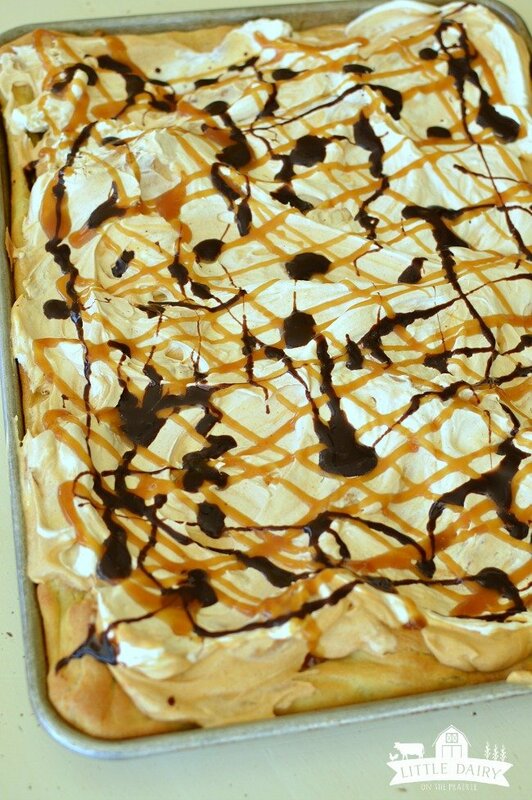 I’ve never had an eclair cake, but I clearly need to try it now! I can’t wait for you to try it! We can’t stop eating it when I make it! Looks like a crowd pleaser. 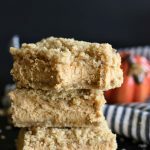 This dessert is one of my favorites because I always have extra company throughout the holidays and this recipe makes lots! It’s always a hit too! It’s the perfect time of year for a pumpkin-flavored cake! My husband would love this! 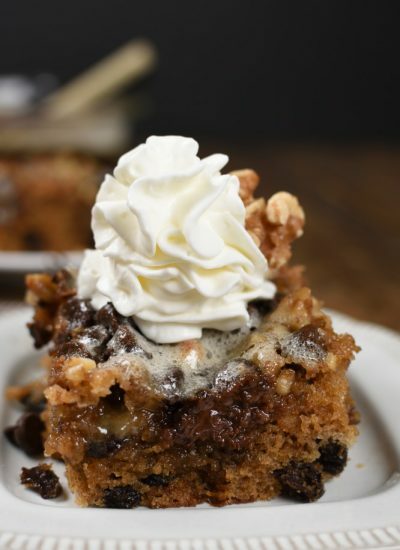 It’s a quick and easy dessert that your hubby is sure to love! What a gorgeous dessert! 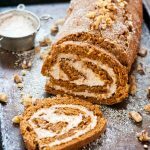 This would be an amazing dessert for Thanksgiving! Yummy! This is definitely easier to make than pie, and every bit as tasty! 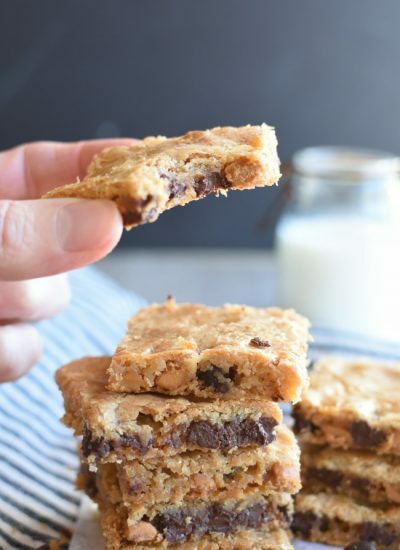 Easy desserts are always my go to desserts! I just think this is the best. I just pinned this!